"Delicious Italian bread made in the bread machine and then baked on a pizza stone. Wonderful!" Here is a tip that I use when baking on a stone.I let bread rise on a piece of parchment paper on a cookie sheet,then just slide paper and bread onto stone and bake.It is so easy. 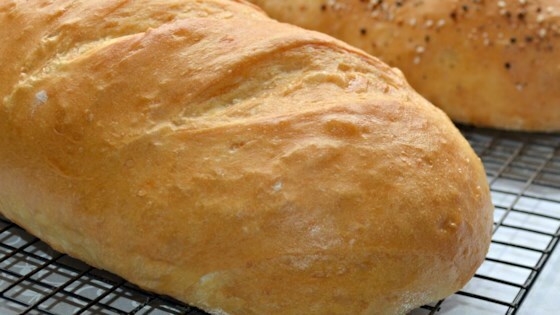 Good basic Italian Bread recipe. Good texture and taste. I sprayed a bit of water in the oven, several times,as it was baking and gave it a nicer crust. I reccomend trying this one.